LG has confirmed that it will launch a 5G smartphone on 24th February at the MWC 2019 event. The news comes from a press release posted on LG’s official website for Korea. According to the press release, the 5G smartphone from LG will have the Qualcomm Snapdragon 855 chipset and a 4000mAh battery. The brand has also revealed that its upcoming smartphone will feature a Vapor Chamber that is 2.7 times larger than the heat pipe in the LG V40 ThinQ. 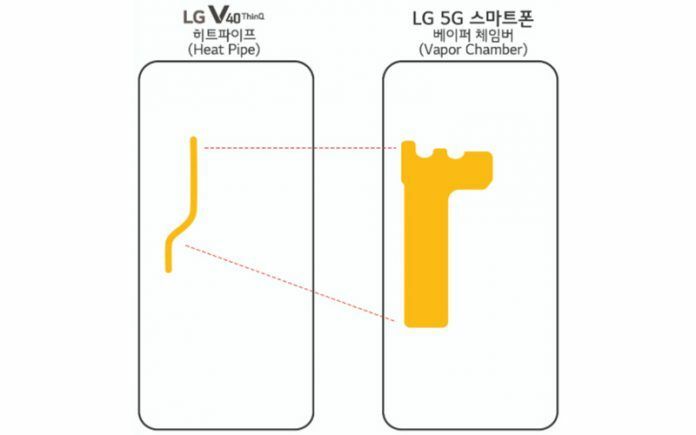 To demonstrate, LG has posted an image comparing Vapor Chambers of both smartphones. LG says it is in talks with major network carries in Korea, North America, and Europe to supply first-batch of 5G smartphones. Last year, the brand announced that it will supply a 5G smartphone to Sprint. It looks like, the upcoming device from LG is that very 5G smartphone. This upcoming 5G smartphone could very well be the LG G8, but we don’t know that for sure yet. Most probably, LG could launch the G8 and a G8 5G, the latter will be available for regions with 5G connectivity, whereas, the former will available in rest of the regions. We are also likely to see 5G smartphones from brands like Samsung, Sony, Huawei, Honor, and Xiaomi at the MWC 2019 event. Earlier, the brand had teased its upcoming 5G smartphone in a video, where the brand showcased that it will have a new gesture control navigation system. Apart from that, and this press release, there is no other official information regarding the device. The upcoming 5G smartphone from LG could carry over the same P-OLED display from the V40 ThinQ, which has a 6.4-inch screen size, QHD+ resolution, HDR10, and Dolby Vision. LG might shift from traditional notch to a waterdrop notch in its upcoming smartphone, but we don’t expect it to have a punch-hole display. The device could have Gorilla Glass 6 instead of the Gorilla Glass 5 in the V40 ThinQ. The device will most probably have IP68 certification for dust and water resistance, and MIL STD-810G standard for drop and shock resistance. As the press release has revealed, the 5G smartphone from LG will come with Qualcomm Snapdragon 855 SoC, which has eight Kryo 485 cores, and Adreno 640 GPU. Qualcomm claims that Snapdragon 855 is 45% faster than its predecessor. The device will come in multiple configurations. The base variant could have 8GB of RAM and 128GB storage, while the top-end variant could feature up to 10GB of RAM and 256GB storage. The device will undoubtedly run on Android 9 Pie operating system with LG’s UI customization. There are no guesses for battery capacity either, as the press release has already revealed that the device will have a 4000mAh battery. The existing flagship from LG, which is the V40 ThinQ, has Quick Charge 3.0 fast charging in spite of the chipset supporting the Quick Charge 4. The upcoming smartphone could change this; it might have Quick Charge 4. Coming to the cameras, the device might carry over the same triple-camera setup from the V40 ThinQ. The triple camera in the V40 ThinQ has one 12MP sensor with normal FoV, one 12MP sensor with 2x zoomed FoV, and one16MP sensor with wide-angle FoV. There will also be 4K 60FPS video recording option.